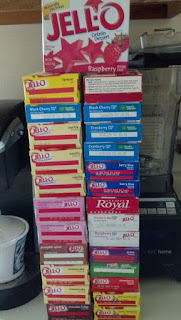 Yes, that's my Jello/pudding stash. I just can't help it, I get to the store and see the great new flavors and think, ooh! have to have it! Then they sit in the cupboard. I've vowed to start using it up, and when Joan (a fellow volunteer Taste Of Home Field Editor) posted this recipe on Facebook, I saw an opportunity. I had an "extra servings size" graham crust so I upped the strawberries to 4 cups. Since the goal was to use up what I had, I used regular pudding (3 3oz Vanilla Cook N Serve) and regular strawberry Jello. That's 4 packages gone! I had to finagle the crushed pineapple, the can I bought seems to have disappeared. I drained 2 Pineapple Dole Bowls, ran them through the food processor and then drained them again. Perfect. This really hit the spot on a hot June day. I will definitely give it a try with other berry/gelatin combinations. Thanks so much to Lou W for sharing the recipe! Somehow I've managed to make it into my 40s without ever having a chili dog. I saw this recipe in the June/July 2016 Taste of Home and pinned it to try. I made no changes to the chili itself, but I did forgot to line the insides of the roll with mustard, will have to remember that for next time. My guys aren't into chili, and I'd considered reducing the recipe, but I'm glad I didn't. I froze the remaining chili in single person portions. Thank you so much to Patricia P for sharing her recipe!